Miracle Ruby—the ACE that keeps on giving. What’s good about it: “Any Phase,” Miracle Ruby doesn’t use your Support for turn. 1000 HP is a fair amount to Revive with. You will see this card again and again, at least until your opponent hits 4 KOs. Revival reduces KO points given to 1, regardless of being a Mega or other effects in play. What’s bad about it: Like with all Revival effects this card still grants your opponent KO points. Tips: Combining with Megas that can get Aces like “Metaletemon” can let you use this without aggressive mulligans, letting you go full-power for far longer. Mega-centric evolution strategies like “Hyper Digivolve”, or Megas with Champion DNAs (like “Goldnumemon” and “Saberleomon”) can use this to force your opponent to KO your mega 4 times. Use cards like “Metal Banana” at that point to stay in the game with a large body that can deal a lot of punishment. Beware that revival-loops can be good, but can also trap you into a known-defeatable strategy. Consider letting one pass if your opponent sets up against it too much. Death Evolution—A new firewall and stops Evolutions in their tracks, and maybe an Option. What’s good about it: It has a very rare ability: the power to be played during the Evolution Phase and void an Evolve card. On top of that, it can also stop an Option card later in the Support Phase, if you choose. If your opponent has no way to play around it, this can be a hard one-two combo that floors them. What’s bad about it: Overall, it’s less powerful than other firewalls such as “Cherrymon’s Mist”, and isn’t for every deck. You have to make the decision to Support with it during the Evolution Phase, which can give your opponent enough information to play around it. Since it can only void Options, this gives it a more limited scope and the opponent might have wanted to support with a Digimon (or not at all) anyway. Tips: Those precious 3 Firewall slots have to be thought through carefully. What can you really use? What synergizes? What can you re-use? While it technically can be played around, let’s not underestimate the power to buy a turn by stopping an Ace from even being played. Also, if you have no Evolutions to void, you can always play this in the Support Phase regularly, which gives you flexibility. If you reveal to void an evolve, then discard it on purpose, there are ways you can re-use it later via recycle or similar. What’s good about it: Wargrowlmon provides a crazy-high reduction in DP cost. It has a very easy DNA, since half the requirements just have to be and Level U. The HP on this incarnation of terror is huge for his typing. “Attach D”, while not incredibly ridiculous by itself compared to other Cross-abilities, is monumentally horrifying when paired with the passive “Attachment Slots +2” and “Unaffected by Shatter”, since this means you get to set up 3 (non-Ace) attachments from your deck in a row, with no ability to be stopped. 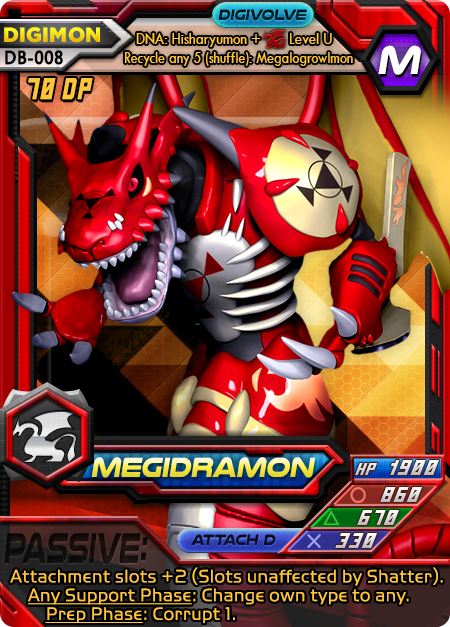 Megidramon can also change its type every turn to make best use of all the “Crest” attachment cards and evade “x3 VS” abilities the opponent may have. The cherry on top is how it slowly corrupts the opponent’s deck into oblivion over time. What’s bad about it: Try actually setting up those 3 attachments with only his attack. I dare you. Any opponent with an ounce of fore-thought will see right through it and plan around it, possibly going for a one-hit kill with their Ace. Megidramon also has a more “balanced” style of attack Power for his huge DP cost, so he doesn’t really stand out anywhere, including . This is a nearly-pure setup Mega and should be supported as such. Corrupting 1 every turn is very slow if you’re not also supporting that ability with similar abilities. Changing your type off of Dragon usually makes you more vulnerable to “x3 VS” in general (opponents can play Digimon on their turn, you know) and turns off a lot of their best supports. In addition, an opponent with the rare Counter- (or “to-Zero”) is going to see your setup coming a mile away and make you eat dirt. Tips: While it’s usually not advisable to build your supports/options around your Mega, Megidramon makes it necessary to at least coincidentally support him. Without backup, he’s just a whole lot of effort for very little payoff. If you can keep his health up, anticipate anti-Cross plays, outfox “Vademon” plays, and keep your opponent dealing with this five-alarm-fire of a Digimon, he’s incredibly rewarding. 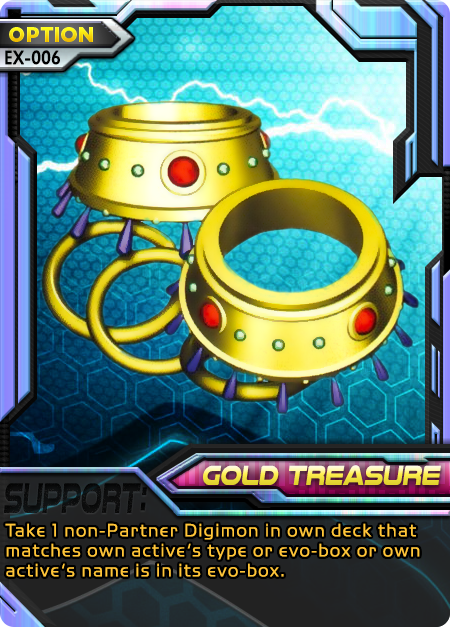 Make sure that the support for him in your deck works just as well for your Level C and Us, unless you have a dedicated speed-evolve strategy like “Hyper Digivolve”. Incubator—An Evolution from the up coming Data Beakers set. Attach a card from your deck while evolving. What’s good about it: Incubator lets you set up your newly-evolved Digimon for a much more fruitful lifespan right out of the box. It replaces itself after you use it, with the handy draw 1. Since you’re evolving by DP to use the effect, it also stacks with the effect of “Super Tag”. This is easily one of the best toolbox cards in the game due to how hard it is to void evolutions. What’s bad about it: This card is an Evolution that gives you no discounts or ways to speed up evolution; thus your plan needs to be sound from the beginning. Incubator doesn’t let you get “Sincerity Mask” or cards like it. 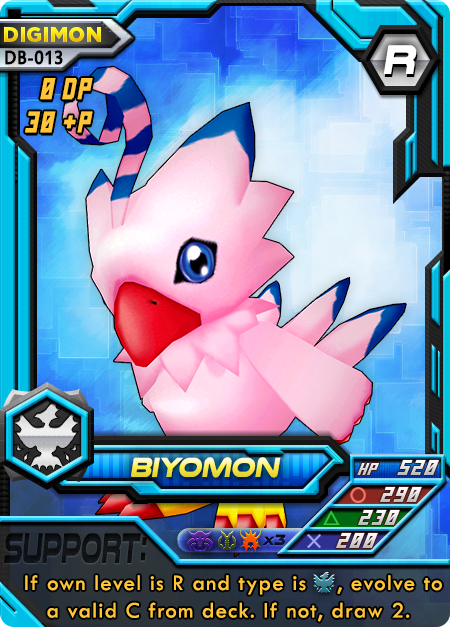 You can’t use it on any Digimon that is not actually evolving right then, including abnormals. 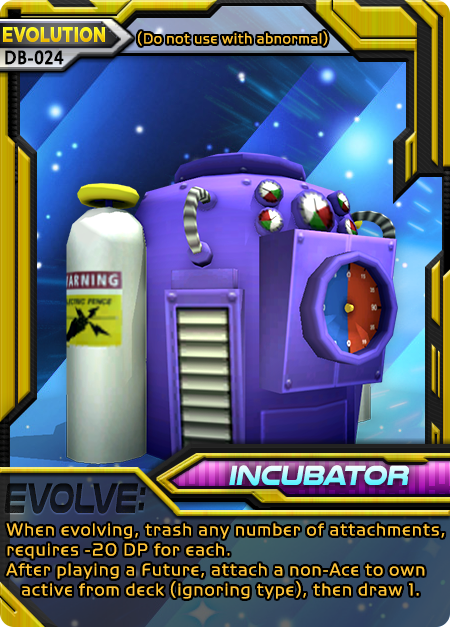 Tips: Running several different attachments can really help Incubator shine—one of the Crests and “Stardom” are a good starting point. Running “Super Tag” with this lets you keep your DP with the attach. Remember, look for the words “Attach to…” for cards that are legal attachment targets. Not just anything can be attached, you know! Gold Treasure—A Partnerable Option that helps you get Champions and Ultimates from your deck. What’s good about it: Gold Treasure can fetch you a Digimon for evolution; or you can be cheeky and use it to toolbox supports. The card you search can be one that either has your active in its evo-box or has some card you reveal from hand in its evo-box. The reveal isn’t forced—you don’t have to give up any extra info to your opponent if you only need something that comes from your active. What’s bad about it: This card is a utility card, it helps you for the next turn, not this one. Tips: Gold Treasure can let you run a wider variety of Champions and Ultimates in your deck and toolbox them for support and evolution box effects. It’s also really helpful for setting up DNA evolution for Ultimates. You can also do really weird things with some of the less-orthodox evo-box names like “Whamon”. If you have the Ultimate Whamon in hand or on active, you can search the same card! If you want to hedge your bets and you have set this as a Partner Option, use it on a Rookie with a good immediate effect: “Renamon” has a void effect that can come in handy when you need something now, while Gold Treasure can set you up if you’re fine. Chip D—pure card manipulation of both players decks. What’s good about it: Chip D lets you know what cards are coming and set-up your deck a little: Recode means you get to look at that many cards from the top of your deck and put them on the top or bottom. 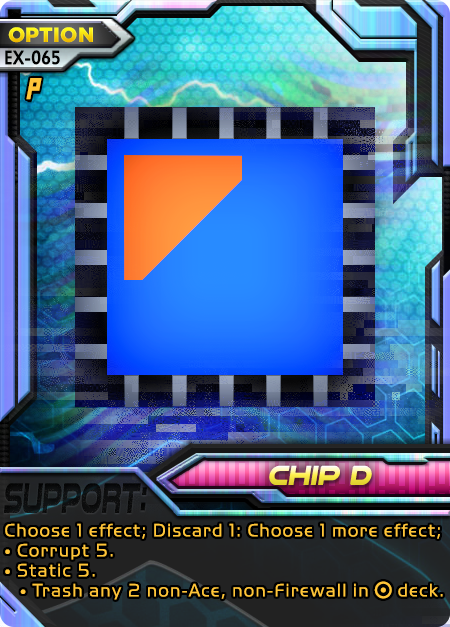 “Chip” named cards will become searchable by effects in the upcoming Data Breakers set. You also get a heavy control over your opponent’s deck with Corruption—an effect that lets you seal the opponent’s top two cards in the deck back down or to the bottom. What’s bad about it: This card is a pure set-up card (it gives you nothing substantial when you play it.) It wont help you when you’re behind. You need to be keeping up with your opponent and wait for the right opportunity to play this. Tips: Chip D is good when played with powerful trash-cost effects like “Mega Chip” and “Dark Wings.” These cards help both by giving you trash to work with for the “recycle any 2”, and by giving you a very powerful effect to make up for this setup card. This can be a heavy advantage-maker when paired with other Recode/Corrupt effects, ultimately filtering one or both decks into oblivion. “DB006” and “DB007” let you make a Chip-based deck that uses this card heavily for consistently obtaining various Chips. Beam Gun—Make your Power 0 to halve your opponent’s HP. What’s good about it: Beam Gun can turn a lop-sided fight in your favor—giving you a virtual attack that is much higher in situations where you’re behind. It’s very helpful for Crash and Counter attacks since they already have 0 Power. What’s bad about it: Halving isn’t always going to be better than a normal attack, so this card requires specific timing and doesn’t work well when you’re already ahead. Escape Raft is better in situations where halving + attacking would score, and you can spare the 7 cards to trash. Tips: Run Beam Gun with Crash Digimon, or high HP Digimon (which tend to have lower Power). 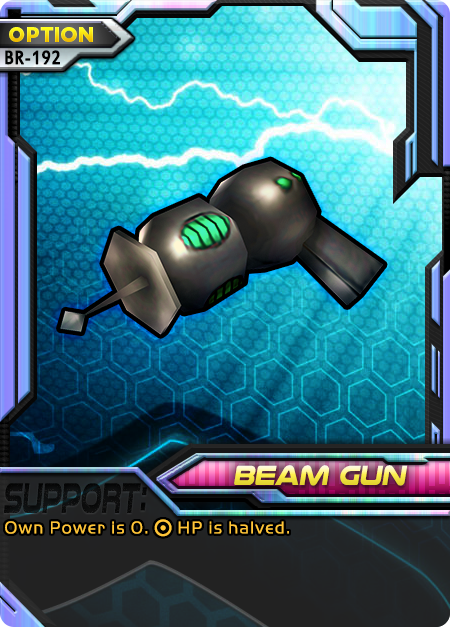 Try to save Beam Gun for when your opponent gets up to Mega, since they can’t evolve to recover the HP this removes and can set you up for 2 KO points. Running other Beam-Gun-like effects such as “Gazimon” can really help iteratively bring down tanks. Super Tag—an Evolution card that provides +10P and save all your other DP after you evolve. What’s good about it: Super Tag puts itself into DP, so it doesn’t take your one Rack-up for the turn. 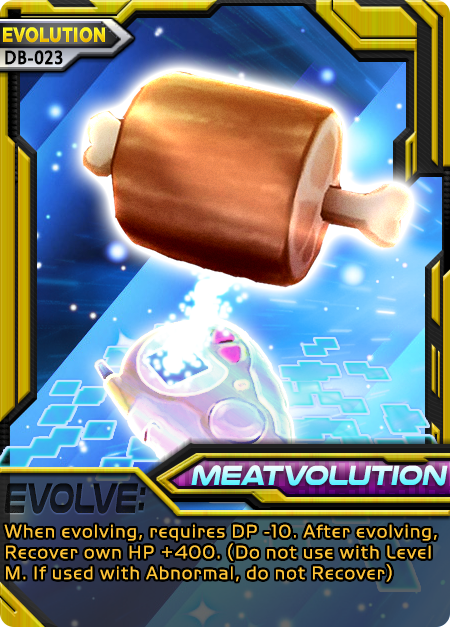 It’s one of the few Evolution cards that work when going to Mega. Saving your DP for later has obvious evolution benefits, as well as assisting some effects. What’s bad about it: This card does nothing for you if you don’t have other cards charged to DP (and progressively better the more you have)—”+10P” is helpful but gets you nowhere on its own. 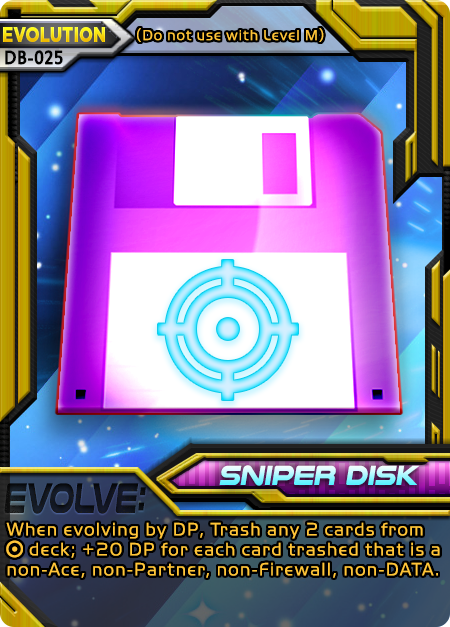 You don’t get to keep your DP if you use an Evolution card that requires DP like “Warp Digivolve”. Since it has to be deleted, you have to plan carefully around the precious few times you can use it. Tips: This card is amazing for decks that want to evolve quickly and keep evolving consistently. 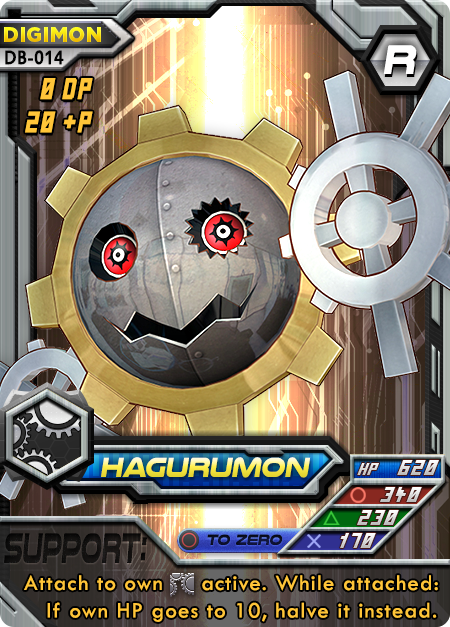 It helps card effects like Rusttyrannomon, Devidramon and Weregarurumon become really powerful. 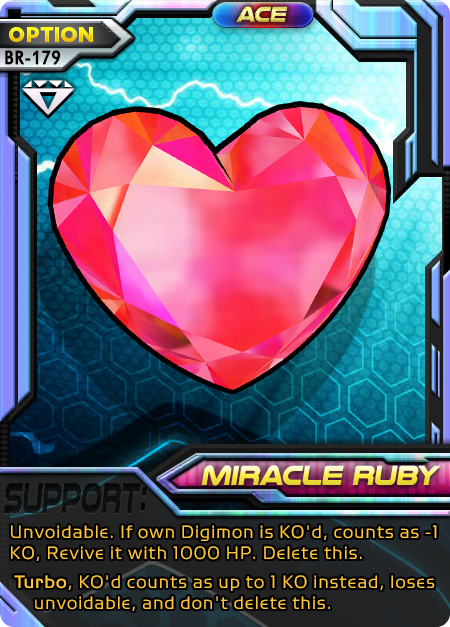 Playing it with the Evolution card “Digivice” will give you even more ways to keep your DP for later. Don’t bother trying to stack Recycle effects to re-use this, since it gets deleted, but recycling can still help you get it in the first place, in case it gets trashed or discarded. 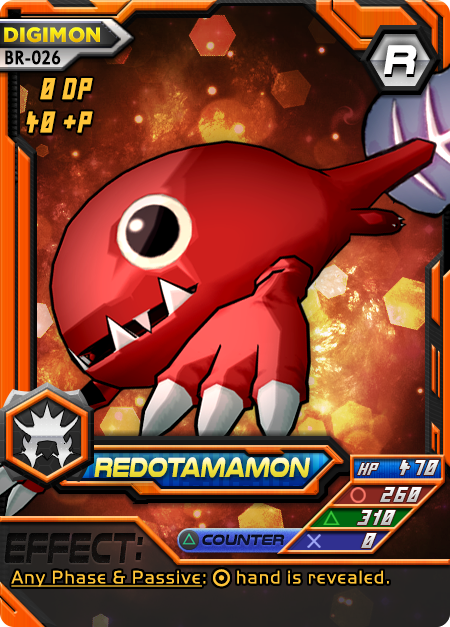 RedOtamamon—the only “+40P” in the game thus far. What’s good about it: RedOtamamon gives +40P—double the average Rookie. Its effect is small but useful: looking at your opponents hand can help you chose attacks, future supports and determine whether it’s the right time to use any “Activate” abilities you have. It is also outside of support phase so good luck voiding it. What’s bad about it: RedO’s ability shuts of your support for the turn, so it’s harder to use the info you get. His body is terrible, though if you’re actually attempting to use this in , Rookie bodies don’t matter much to you anyway. Tips: This card is well suited for fast evolve decks; 40DP with get you to majority of Champions and Ultimates in the game. Its effect helps when you’re ahead, letting you leverage the information you gained to stay there (one turn late). 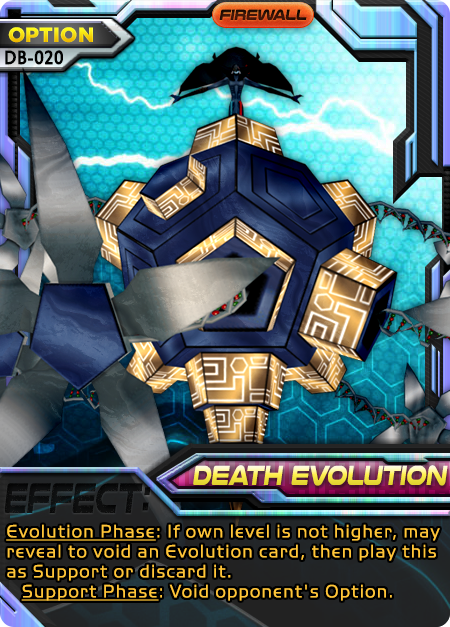 Evolution cards like “Warp Digivolve” and “Hyper Digivolve” help the 40DP from RedO take you much farther. RustTyrannomon—A Mega with a huge potential power boost or heal. 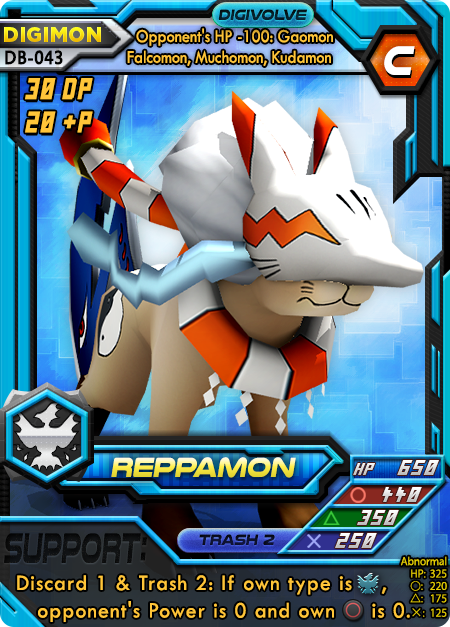 What’s good about it: The “Activate” effect of RustTyrannomon happens when attacks are revealed—on either player’s turn. The +50% multiplier gives you a huge boost to either Power or HP, whichever is most needed at the time, which makes this a tough card to overtake. What’s bad about it: You have to use —the easiest attack to stop in the game. 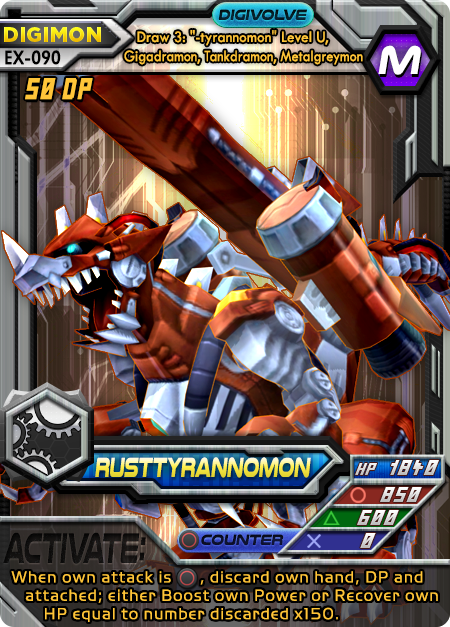 RustTyrannomon’s own ability is rather dull (most of the time Counter on a Mega is worse than using your other attacks). You have to discard everything; your hand, your DP, and your attachments, which is a huge price and will cost you the game if used flippantly. Tips: It’s best to use RustTyrannomon’s “Activate” as a threat, not a promise. Once it’s used, it’s done and your opponent just has to adapt but until then, it’s still formidable. 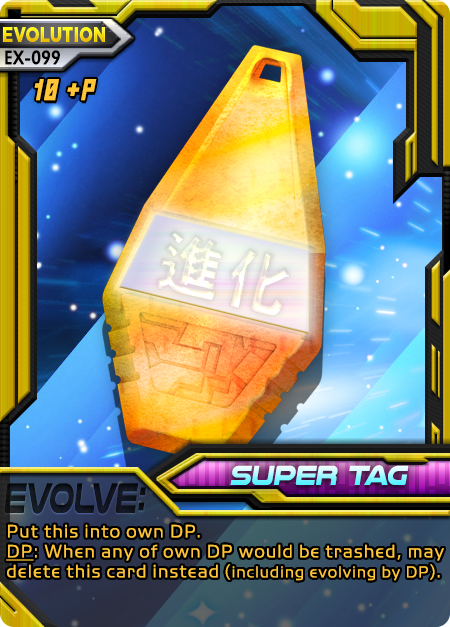 Evolution cards like “Super Tag” and “Digivice” leave your DP alone, letting you charge Rusty like a proton cannon. Cards that allow you to easily support from the top or draw extra cards can keep your hand high without giving up supports. The card “Training Manual” is good both the turn you use his ability, and the turn after. Always try to see if there’s a way to threaten a one-hit-kill with him first, make your opponent outplay it, then just boost your power some other way. HP gain is usually the best and safest option and can allow you to replenish your hand quickly, which can surprise an unprepared opponent. Try to see if your opponent has any cards that force discards such as “Scummon’s Curse” before committing the activation or you may find yourself using a weaker cannon and have an impossible time recovering.